The speckles of orange and white on Bevo’s coat match the blurs on the football field as he watches on from the sidelines for his ninth straight season as UT’s living Longhorn mascot. The 14th to hold the exclusive position of the University’s mascot, Bevo is an easily recognizable UT icon with a history that dates back almost 100 years. Despite his role, the University does not own or finance Bevo XIV in any way. Bevo XIV’s owners, Betty and John T. Baker, donate the steer for games and spend more than $3,000 annually on food and maintenance alone. “That’s all on the house,” John T. Baker said. The Silver Spurs, a student organization, has overseen and cared for the University icon through the years. Before he became Bevo XIV, the champion steer was known as Sunrise Studly. Sunrise Studly was renamed Bevo XIV in 2004. Earlier that year, the Texas Longhorn Breeders Association of America named him the National Grand Champion. Bevo XIII and Bevo XIV, who both came from the Bakers’ ranch, are known for their docility. Despite claims the steers are under medication for game days, Betty Baker said there is no need to medicate show steers, which are trained to behave when on a halter. A halter is a strap fastened across Bevo XIV’s snout and behind his head, allowing his handlers to easily maneuver him. Although he is used to game day activities, Betty Baker said Bevo XIV can occasionally be caught off guard. The Silver Spurs, a student organization, care for him at events. Zane Butter, one of Bevo’s handlers and an urban studies junior, said football season is Bevo XIV’s busiest time, but Bevo’s life is not unlike other steers. “Outside of his obligations as mascot, he’s probably a little more spoiled than other Longhorns,” Butter said. 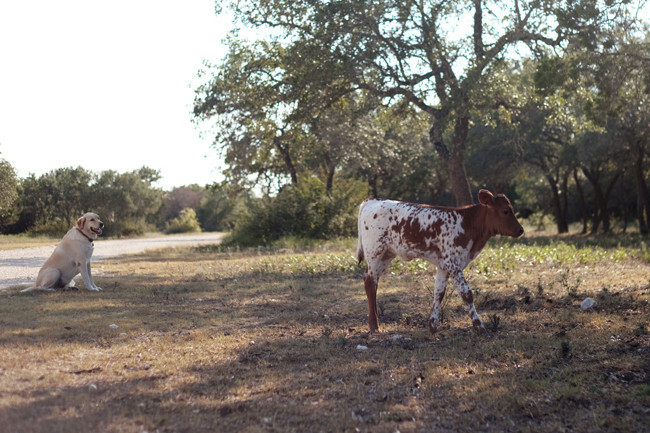 When he is not representing the University at events, Bevo spends his time roaming a 250-acre ranch northwest of Austin with the Bakers’ other cattle. The 2,000 pound steer usually grazes alongside Sunrise Spike, another steer wandering around the Baker ranch, and can eat 60 pounds of feed a day, according to Betty Baker. Sunrise Spike is an 8-year-old Texas Longhorn steer. Raising champion steers is only one of many endeavors that are part of the Bakers Sunrise brand, which also includes a bed and breakfast and the Sunrise Showmanship Camp. Though the Bakers have supplied a University icon for 25 years, John T. Baker is a Texas A&M alumnus, though Betty Baker is a UT alumna. “I was a Texas girl, I was a twirler with the band, but my husband and son are both Aggies,” Betty Baker said. Their ranch home is covered in decorations of Longhorns as well as showmanship trophies, belt buckles, medals and prizes the Bakers’ cattle have won. Bevo XIII is mounted above a banister where his hide lays in the Baker home. Bevo XIII was named Sunrise Express before taking on the Bevo title in 1988 and was the longest-running live mascot with 16 seasons. In recent years, the Bakers have cut back on ranching. Betty Baker said they had to downsize because of the ongoing drought over the last five years and now have 40 cattle. 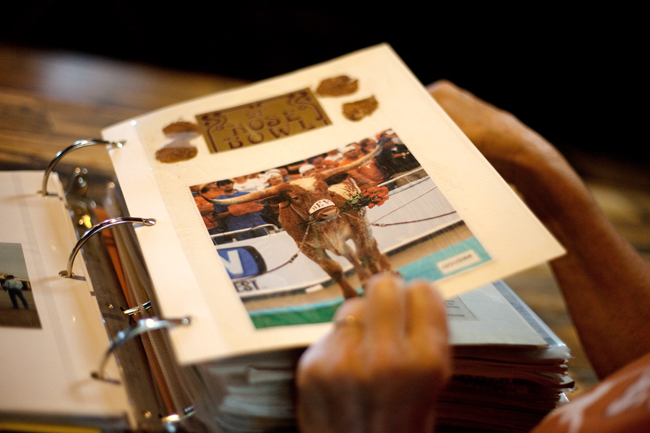 The Bakers also host a summer camp for kids to teach them the proper technique to show Longhorns, including training them to use a halter. The camp hosts about 36 kids from the ages of nine to 17 for one week. “It’s all about learning to halter a calf, calm them down and get them ready for the showroom,” Betty Baker said. Bevo XIV was first halter-broken by a camp-goer. 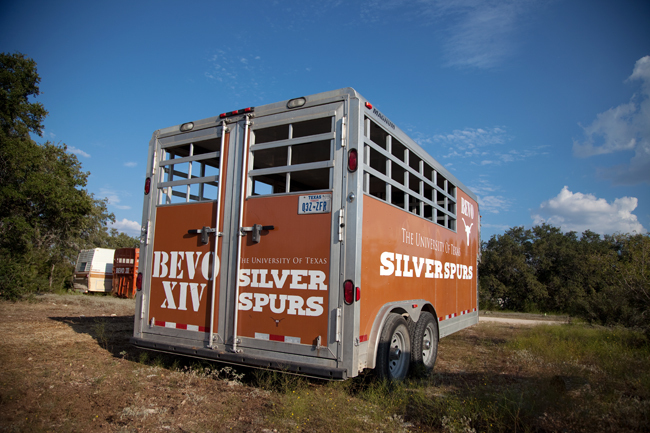 The Silver Spurs student organization is in charge of transporting Bevo XIV. 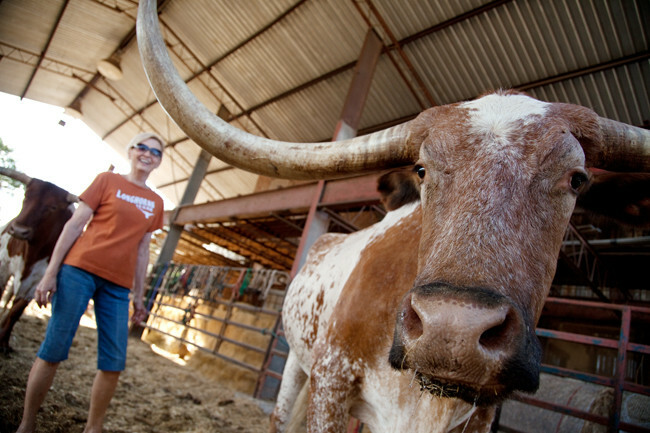 Each year, a new group of student handlers is tasked with wrangling Bevo into his trailer, situating him at events and getting him home safely. The handlers work to place the halter correctly while avoiding a rip or tear from a misplaced horn. Bevo XIV’s horns span more than six feet. Butter, the student handler, said because of Bevo XIV’s busy schedule, the handlers work to understand and communicate with the steer to keep events running smoothly. “We spend so much time working with him that we can tell what kind of mood he is in, which is important when we are out at an appearance,” Butter said. The Silver Spurs Alumni Association has maintained the Bevo tradition through the years by selecting the steers and expanding the UT icon’s access to the public. “He’s a living symbol of the University of Texas, so escorting him around is a huge responsibility,” said Ricky Brennes, the alumni association’s executive director. The organization, created in 1937, has chosen the Bevo steers through the alumni association. The alumni association also financed the Bevo Museum located in the Darrell K Royal-Texas Memorial Stadium to preserve the Bevo legacy. The Bevo tradition began 97 years ago when the first orange and white steer walked on to the field during a Thanksgiving Day game against Texas A&M University. That was the only game day appearance the first Bevo made, though, as he was housed on campus and later eaten as the main course during that year’s football banquet. Bevo XIV is now expected to make many scheduled appearances in unfamiliar locations, but Brennes said his student handlers and Bevo’s natural docility make it possible. The Society for the Prevention of Cruelty to Animals of Texas does not oppose the use of domesticated animals that serve as living mascots, including Bevo XIV, as long as they are not mistreated, SPCA spokeswoman Maura Davies said. “When these animals are treated with respect and dignity, and given proper care and enrichment at all times in accordance with all state and local statutes, this tradition is not a detriment to the animals,” Davies said. Brennes said earlier Bevos were not trained in the same manner as the two most recent show steers. Bevo’s role began to change when one steer’s docility allowed the UT community more access to the mascot. Though Bevo appearances began at football games, Bevo XIV is scheduled to appear at a variety of events, including University traditions and charitable functions. Bevo XIV will be at every home football game and travel to the UT-Baylor game. Bevo attends the games for free, but the Silver Spurs require a donation to bring Bevo to other functions. The donation is used to cover operating costs, and the remaining funds are donated to the Neighborhood Longhorns Program — one of UT’s primary charities that benefits about 6,000 East Austin kids through mentoring and tutoring, Brennes said. Bevo XIV might make an appearance for free for another charity in the Austin area, but the association asks for a $3,000 donation for private parties, Brennes said. “If it were another student organization … we’d probably do it for $2,000,” Brennes said. Bevo XIV attends 40 to 50 events a year and is transported in a custom trailer designed to to fit his horns, according to John T. Baker, who helped design the trailer. “We always want to do what’s in the best interest of the animal and keep him comfortable and safe,” Brennes said. The 8-foot-wide trailer is also equipped with two air-conditioning units and custom windows to improve air circulation on hot days. Bevo XIV took over the role as the University’s living mascot in 2004 at the age of two. Now 11 years old, Bevo XIV is expected to make appearances at game days for the next four to five years. The typical life span for a steer is roughly 20 years, according to Betty Baker. Bevo XIII retired at 20 years old and lived to 22. 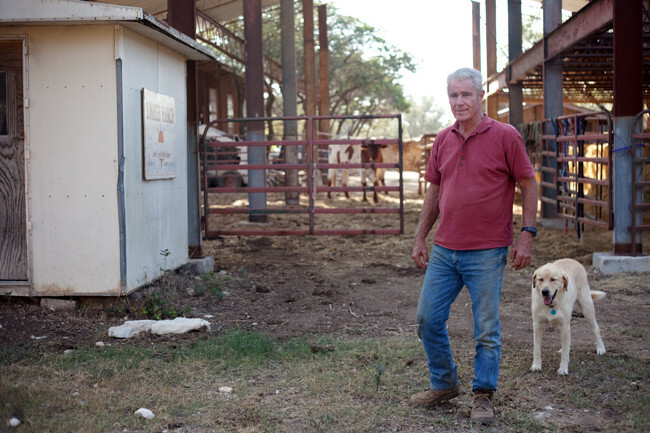 John T. Baker said the breeding of Bevo XIV’s parents, Sunrise Sid and Sunrise Sweet Pea — both docile show cattle — led to Bevo’s championship titles and his role as the University mascot. As a steer, Bevo XIV cannot produce offspring, but the Bakers are now breeding cattle with his genes in mind. Though Sunrise Sid was killed by a lightning strike almost 10 years ago, the show bull is still helping the Bakers produce future show cattle through artificial insemination. In July, the first of Bevo’s half-siblings, Sunrise Sidrita, was born. When Bevo XIV is ready to retire, the Silver Spurs Alumni Association will scout for another Texas Longhorn that exemplifies the breed and represents UT with a distinguishable orange and white coat. Want more Bevo? 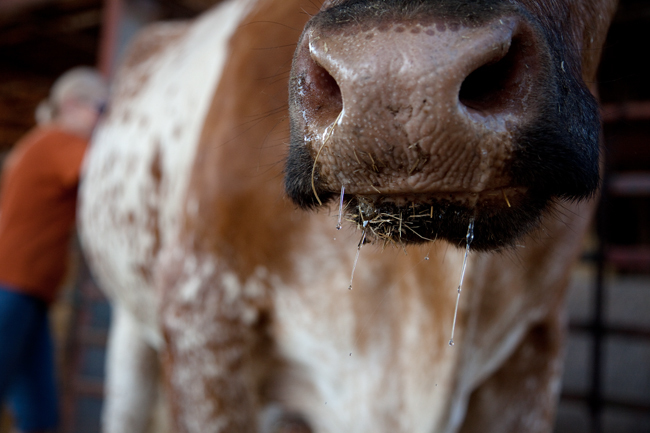 Check out these 14 Things you didn't know about Bevo 14.